By addressing the distribution of forms—both clinical and nonclinical—throughout the hospital, healthcare organizations can create space and save money. Hospitals are paper-intensive organizations. Even those that have implemented EHR systems find themselves using a great deal of paper, much of it in the form of nonclinical and quasiclinical work process forms. According to Scott Wallace, vice president of strategic development and channels for Standard Register Healthcare, the number of forms in hospital departments varies greatly based on the specialty, services provided, region of the country, payer mix, languages supported, and population. Some departments have as few as 20 forms while others have hundreds. Wallace cites a HIMSS Analytics report showing that although 47% of U.S. hospitals currently have electronic forms management software or at least a service contract, many are underutilizing their document automation systems by automating fewer than 50 forms. Darice Grzybowski, MA, RHIA, FAHIMA, president of HIMentors, LLC, which offers HIM and forms management consulting, believes there are a number of forms whose automation could make HIM and other departments more efficient, including duplicate medical record number identification tracking forms, forms related to the destruction or purging of records, forms that note when a record goes to committee, signature processing approval forms, billing-related processing forms, forms for the interdepartmental routing of approvals or requests for information, human resources forms, inventory forms, and release-of-information tracking documents. “A great deal of typing can be avoided by prepopulating these forms with information from an electronic document management system, the EMR, or an archival system,” says Grzybowski. Hospitals typically implement such a forms management program for the entire enterprise and for both clinical and nonclinical forms. Rollout usually begins with the admissions department’s patient registration and consent forms and proceeds to other medical record forms that are not slated to be replaced with completely electronic versions. The hospital estimates annual savings of more than $200,000, including substantial productivity gains. McLendon points out that the benefits from forms management software multiply when it is linked to a hospital’s admissions, discharge, and transfer (ADT) system to automatically print patient names or bar codes on the forms. “There is no longer any need to affix labels, which makes scanning more efficient. And once the forms are scanned, the hospital’s document management system can easily classify them according to document and patient, which minimizes errors and increases safety,” he says. The hospital plans to go completely paperless in the future, including e-signature tablets for patients. Bryant recommends involving coders early in the implementation of forms-management software so they can provide input into the design and flow of pages. While forms-on-demand software reduces the number of paper forms that must be produced and stored, a second type of forms management system saves even more space by creating totally electronic forms. Staff fill them out electronically and also distribute them electronically as needed. In facilities with e-signature capability, staff members or patients can sign forms without ever being printed. 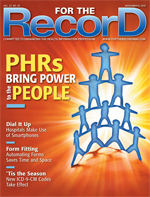 McLendon estimates that more than 25% of hospitals are currently taking advantage of the cost savings of a forms-on-demand system, while totally electronic forms signed on PIN pads are less widely adopted, perhaps because the savings are not significant enough to offset the cost of the technology. He notes that the ability to create electronic forms physicians can complete electronically may not get much traction as hospitals focus more on EHRs. To ensure a controlled rollout with interdisciplinary input, Grzybowski suggests appointing a forms committee. “Without a forms committee, hospitals may encounter problems such as ‘rogue’ forms that are introduced by vendors, physicians, or on someone’s home PC without proper approval or formatting; duplicate forms, both in number and content; excessive forms in an attempt to meet every potential situation for liability reduction; and external forms requirements such as state forms that are not under the control of the provider,” she says. • Analyze the content of forms to ensure they are still relevant and to avoid duplication and redundancy. • Identify any current processes that are not supported by a paper form but could benefit from an automated form. • Delineate the workflow surrounding those processes. • Research and identify a suitable software application for forms automation. • Populate preprogrammed software (if provided by a vendor) or develop software in-house if desired. If a hospital intends to implement both EHR and forms-management technology, Grzybowski recommends beginning with a clinical forms inventory and automating all the clinical forms. Then the hospital can either proceed to the automation of nonclinical forms or implement the EHR. Completing the automation of all forms first may be slightly more efficient, she suggests.